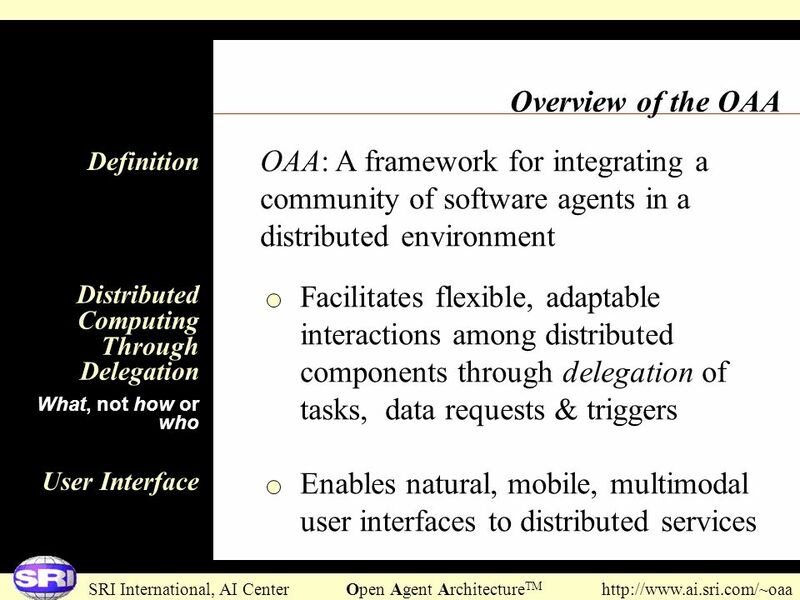 Outline The Open Agent ArchitectureTM Building communities of distributed software agents What is an Agent? 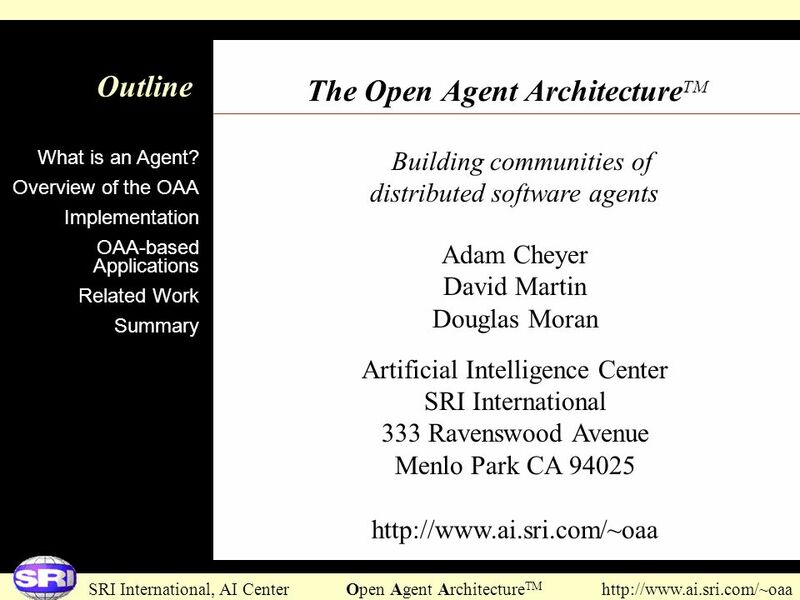 Overview of the OAA Implementation OAA-based Applications Related Work Summary Adam Cheyer David Martin Douglas Moran Artificial Intelligence Center SRI International 333 Ravenswood Avenue Menlo Park CA 94025 This presentation provides an overview of the motivations, implementation, and application of SRI’s Open Agent ArchitectureTM (OAATM), a new framework for constructing distributed systems. 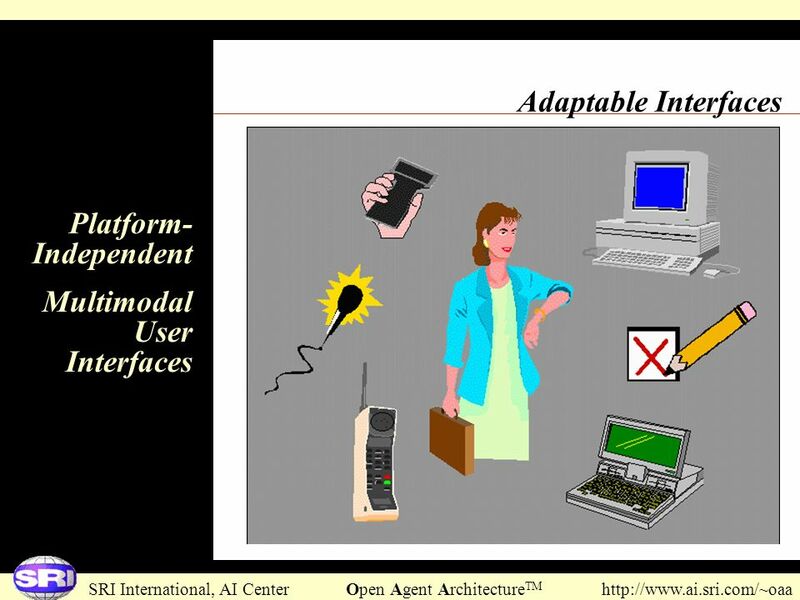 Adaptable Interfaces Platform-Independent Multimodal User Interfaces If applications are going to be made up of many cooperative network services, it is essential that human users have efficient and natural methods for interacting with them. 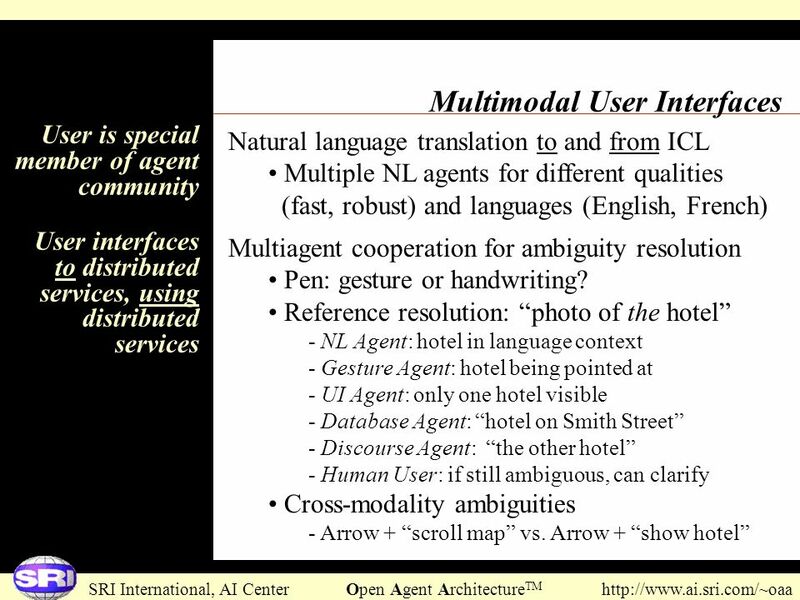 We believe in a multimodal approach, where any data or services can be accessed using flexible combinations of many input modalities -- if graphical user interfaces are available, fine. 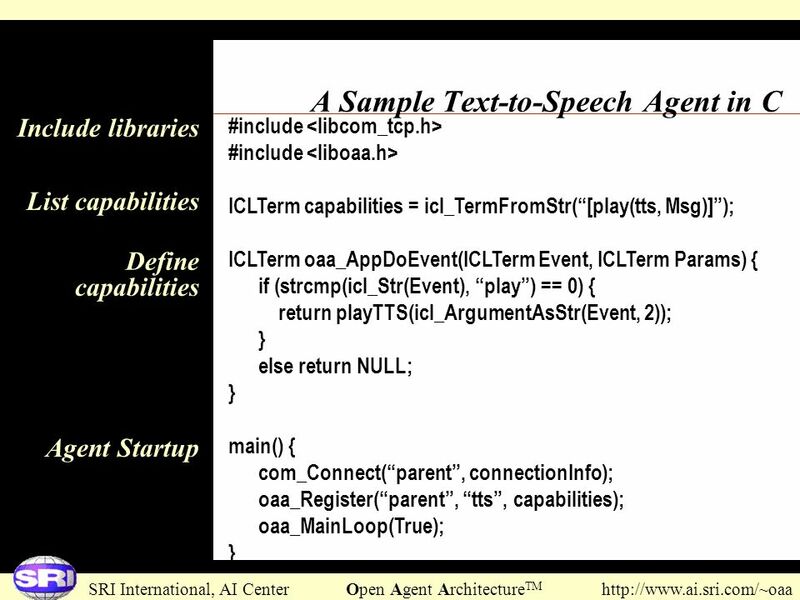 If, in addition, a telephone or microphone is present, speech recognition might be used in conjunction with more standard interfaces. Likewise for electronic pens. 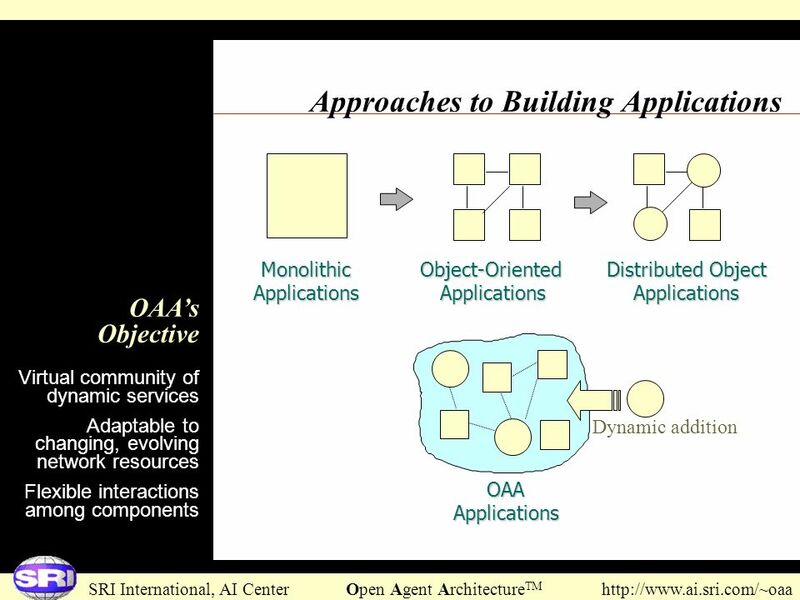 The architecture must be able to adapt to the changing set of input and output resources available to the user. Include libraries :- [libcom_tcp]. :- [liboaa]. 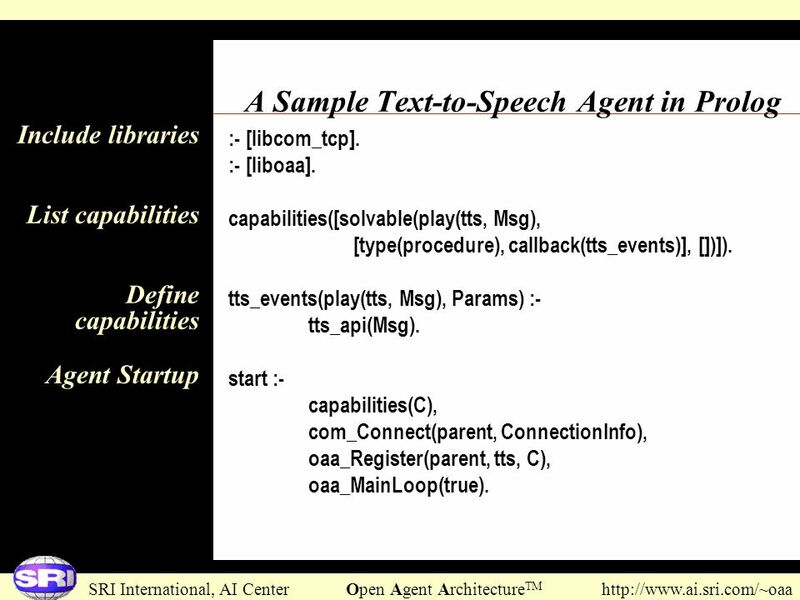 capabilities([solvable(play(tts, Msg), [type(procedure), callback(tts_events)], )]). tts_events(play(tts, Msg), Params) :- tts_api(Msg). 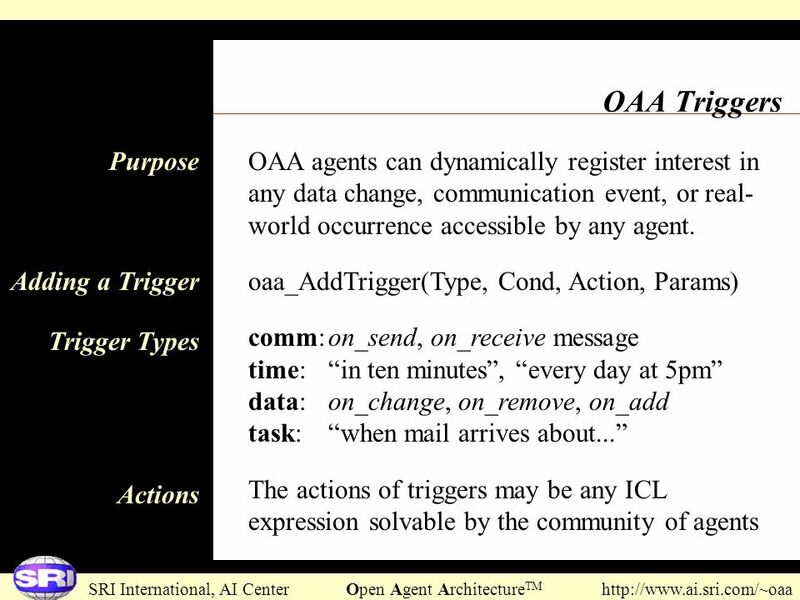 start :- capabilities(C), com_Connect(parent, ConnectionInfo), oaa_Register(parent, tts, C), oaa_MainLoop(true). 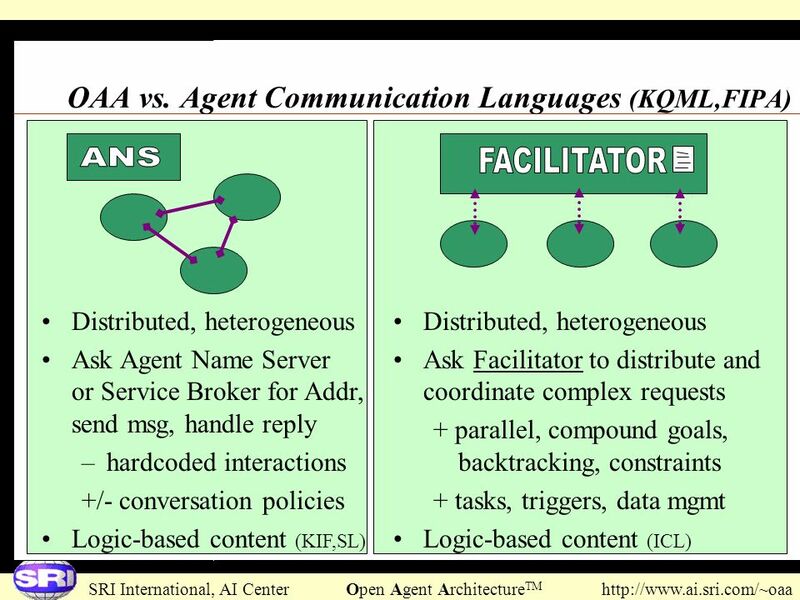 List capabilities Define capabilities Agent Startup The steps for creating a new agent in Prolog are the same as for C, except that parsing agent messages is greatly simplified: include libraries for OAA and choose a communications subsystem. 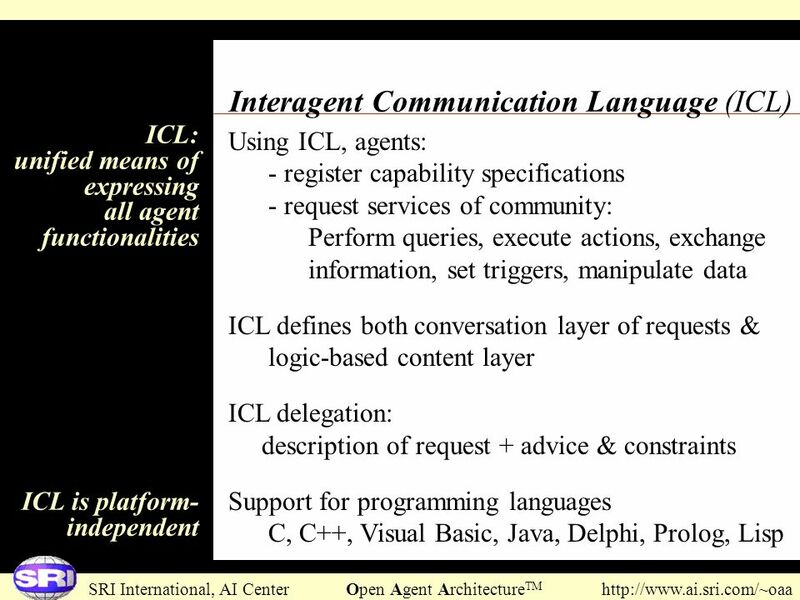 define the list of capabilities your agent can solve using ICL expressions. 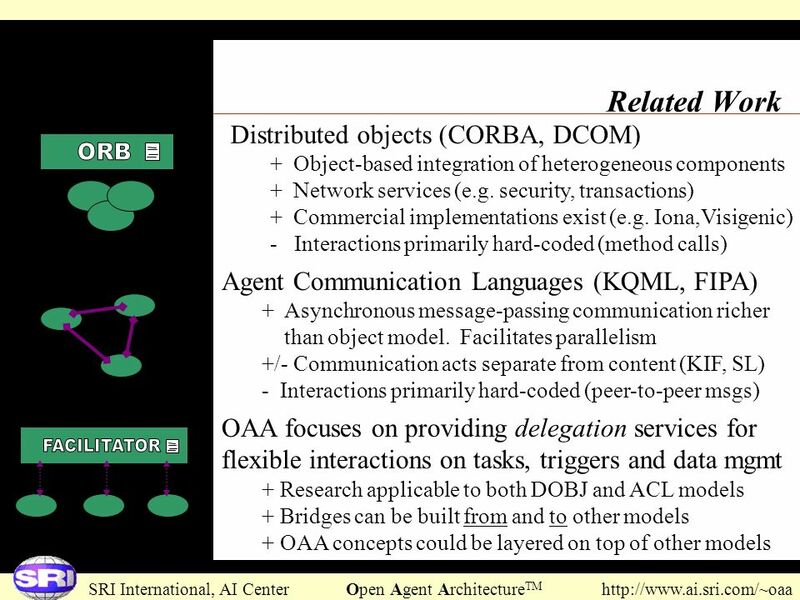 These may be either simple patterns to unify against an incoming request (e.g., play(tts, Msg)), or more complex specifications that include translations and synonyms, executable test conditions or constraints, etc. 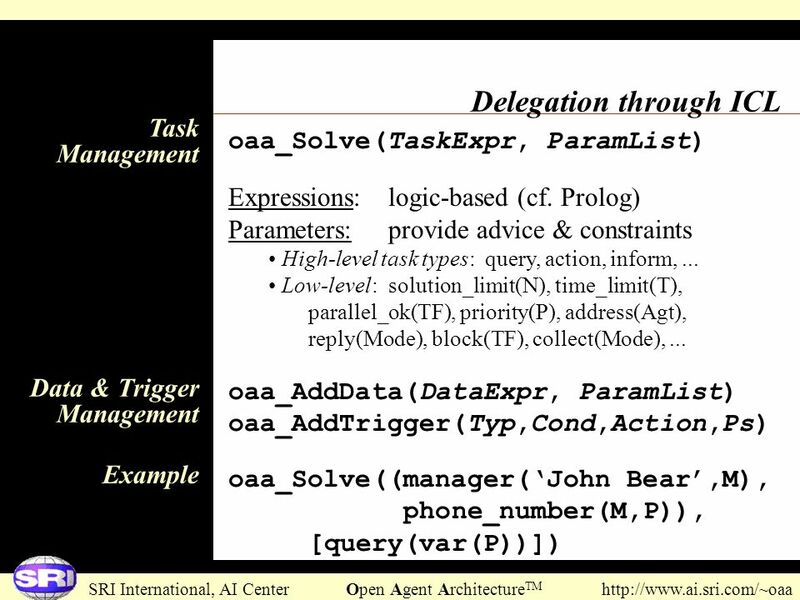 For each capability declared, the agent must map the incoming request to the API of the underlying application. 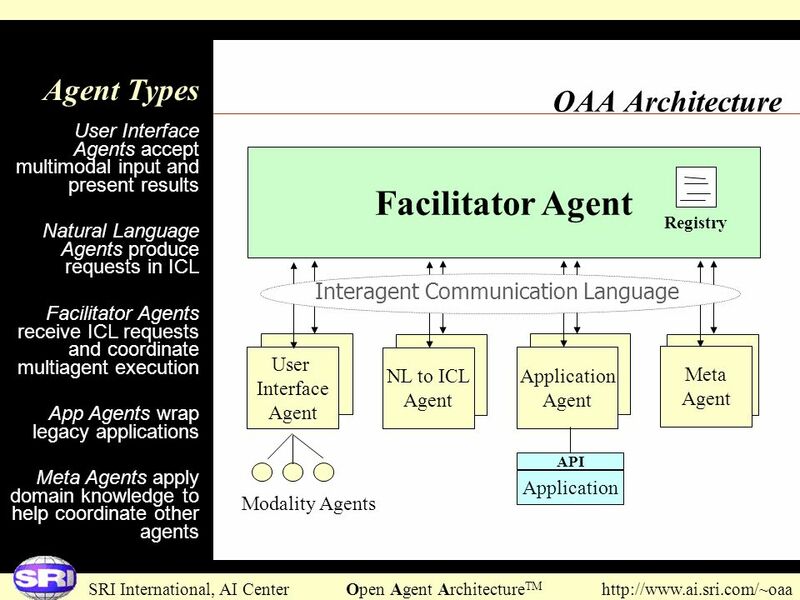 The body of the agent should initialize a connection to a Facilitator agent, register the agent’s capabilities and name with it, and then enter a loop waiting for incoming requests from other agents. 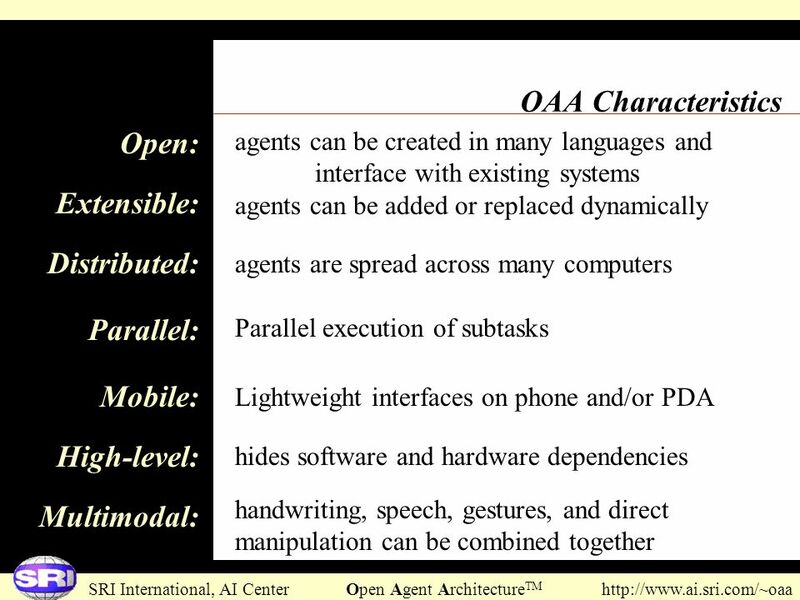 The structure of an agent has been designed to be as simple, intuitive, and as low-overhead as possible. 1. 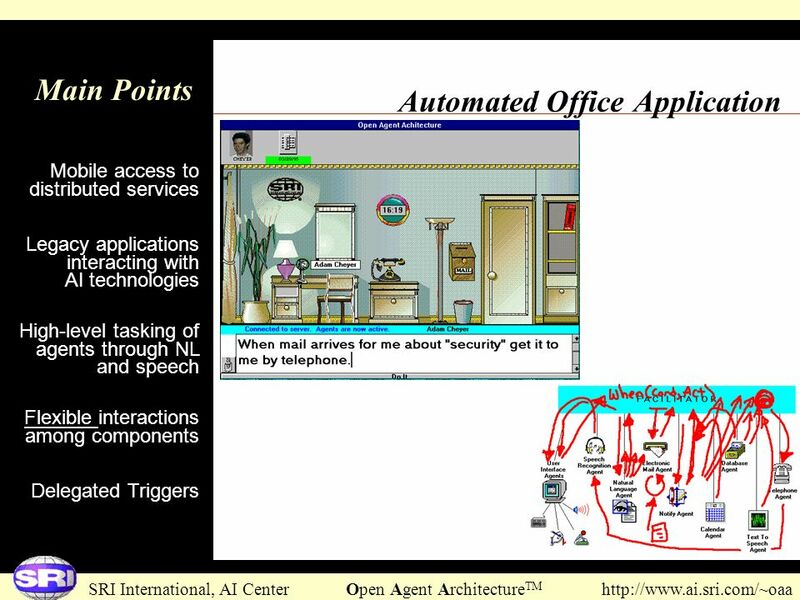 Automated Office 2. 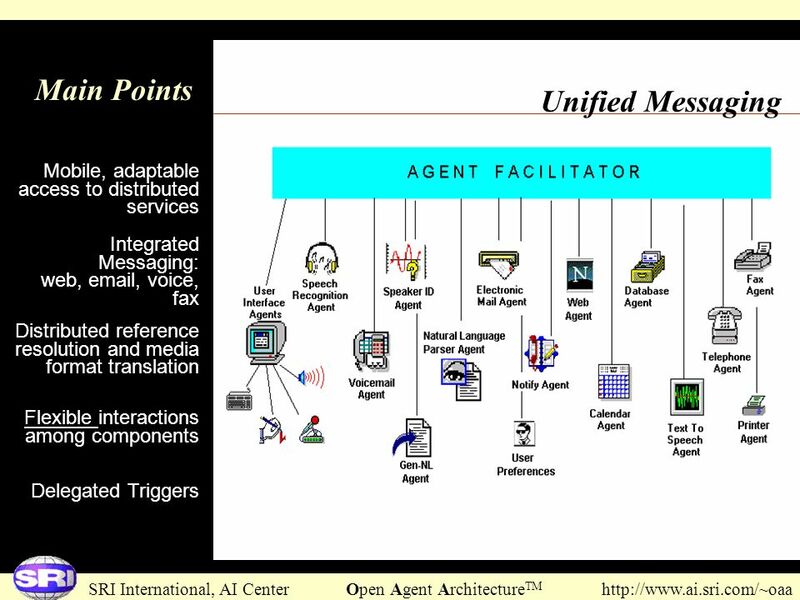 Unified Messaging 3. 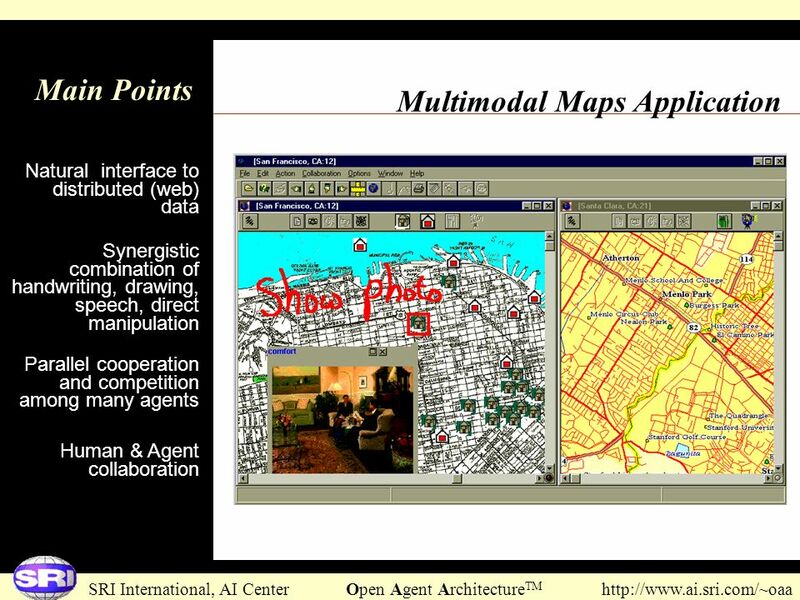 Multimodal Maps 4. CommandTalk 5. ATIS-Web 6. Spoken Dialog Summarization 7. 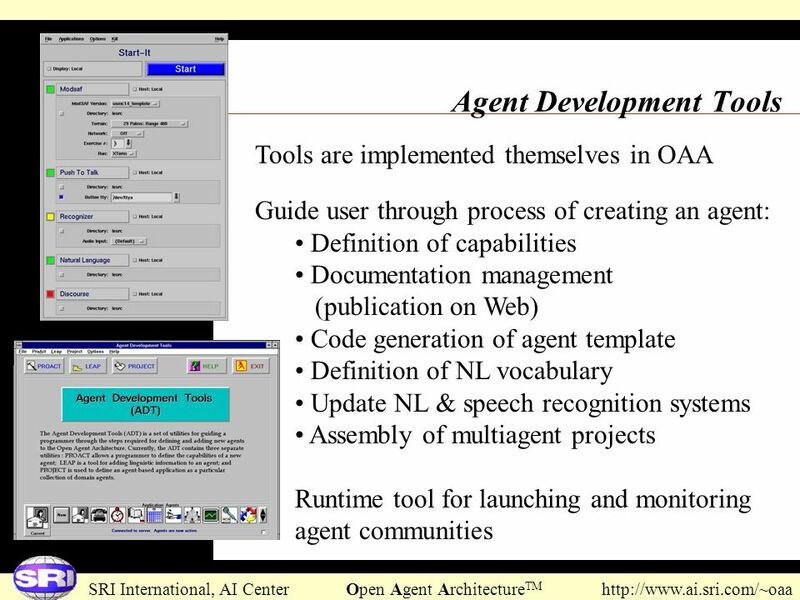 Agent Development Tools 8. InfoBroker 9. Rental Finder 10. 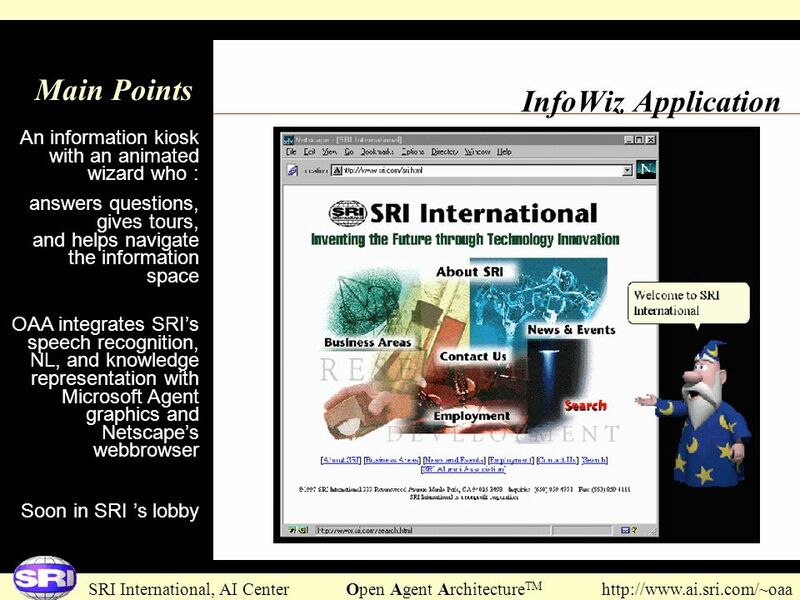 InfoWiz Kiosk 11. Multi-Robot Control 12. MVIEWS Video Tools 13. MARVEL 14. SOLVIT 15. Surgical Training 16. Instant Collaboration 17.Crisis Response 18. WebGrader 19. 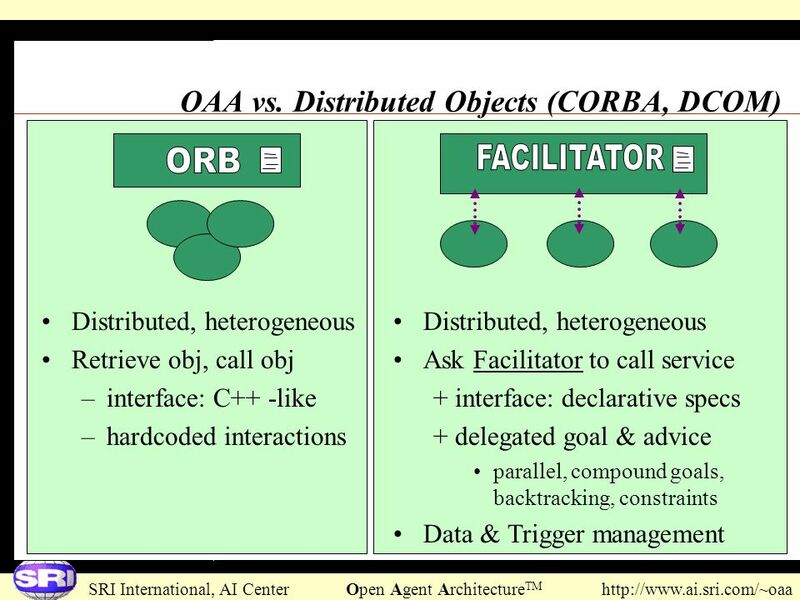 Speech Translation OAA-based Applications The OAA is a general-purpose framework which has been applied to a wide number of distributed applications in diverse domains. 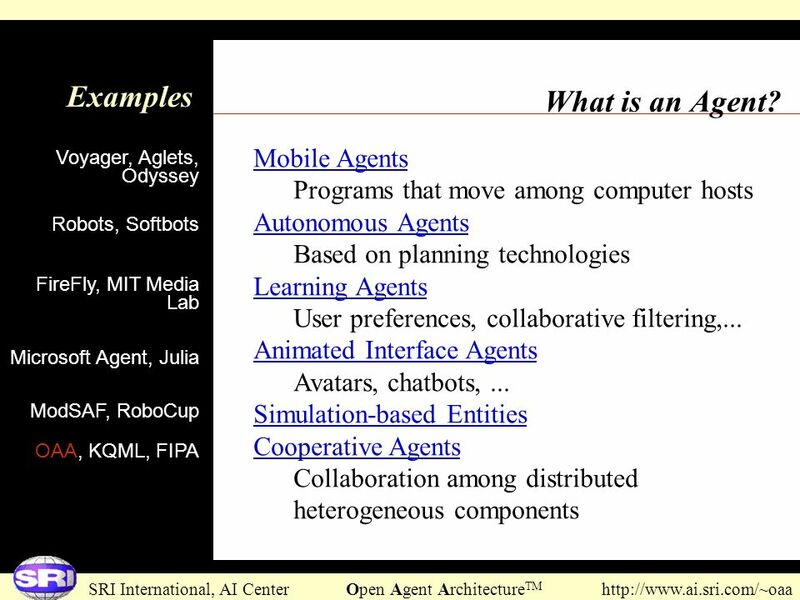 Selected applications will be presented in more detail in the following slides. 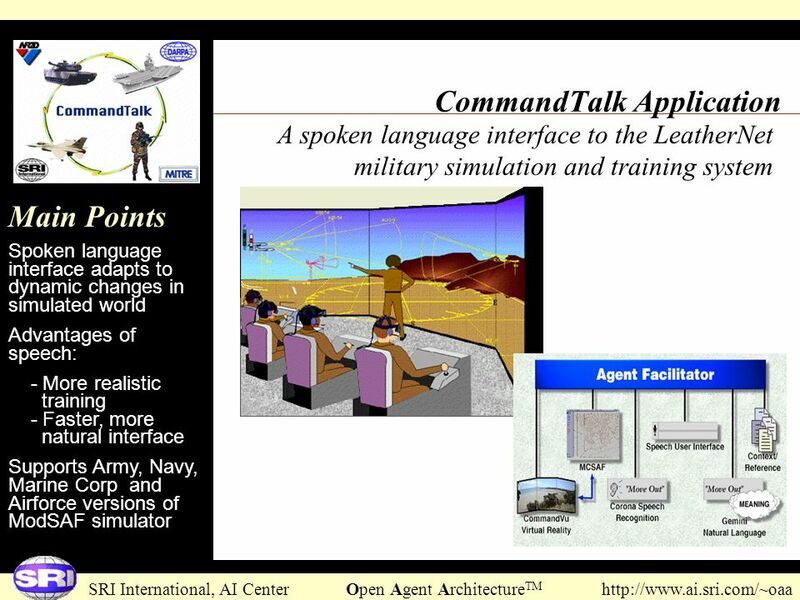 A spoken language interface to the LeatherNet military simulation and training system Main Points Spoken language interface adapts to dynamic changes in simulated world Advantages of speech: - More realistic training Faster, more natural interface Supports Army, Navy, Marine Corp and Airforce versions of ModSAF simulator CommandTalk is a spoken-language interface to synthetic forces in entity-based battlefield simulations, developed by SRI International under our DARPA-sponsored project on Improved Spoken-Language Understanding. The principal goal of CommandTalk is to let simulation operators interact with synthetic forces by voice in a manner as similar as possible to the way that commanders control live forces. CommandTalk currently interfaces to the ModSAF battlefield simulator and allows the use of ordinary English commands to : Create forces and control measures (points and lines) Assign missions to forces Modify missions during execution Control ModSAF system functions, such as the map display CommandTalk was initially developed for LeatherNet, a simulation and training system for the Marine Corps developed under direction of the Naval Command, Control and Ocean Surveillance Center, RDT&E Division (NRaD). 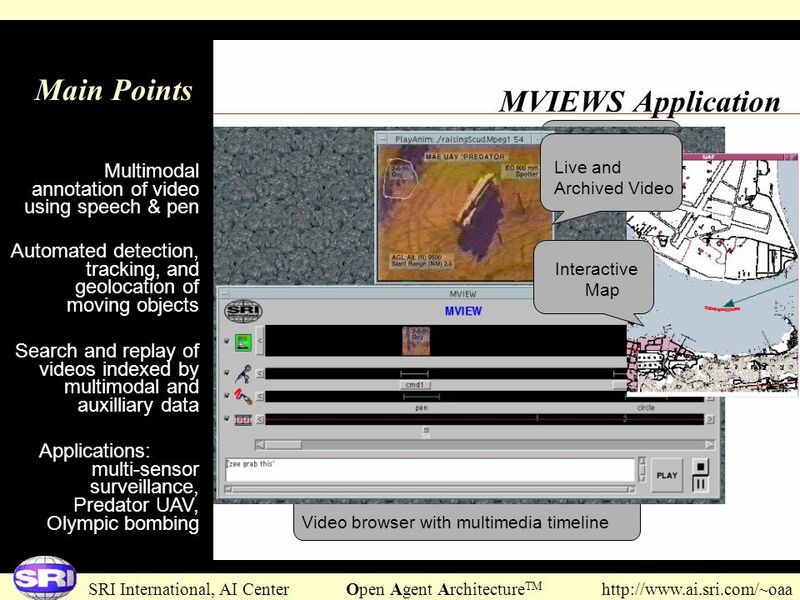 Recently CommandTalk has been extended to Navy, Air Force, and Army versions of ModSAF, to provide control of all synthetic forces in DARPA's STOW97 Advanced Concept Technology Demonstration. 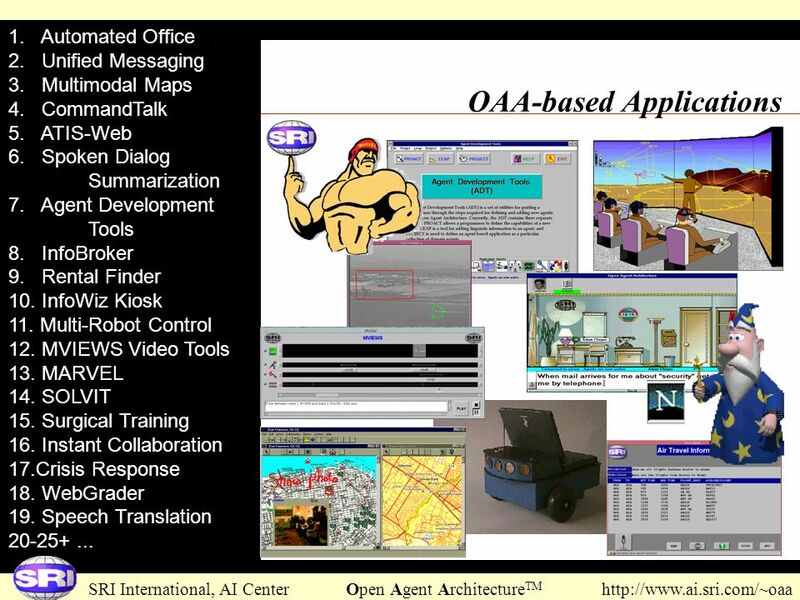 Download ppt "The Open Agent ArchitectureTM"
(2)(2) APNOMS 2003 Introduction Web-Service –A software application identified by a URI –Its public interfaces and bindings are defined and described. |epcc| NeSC Workshop Open Issues in Grid Scheduling Ali Anjomshoaa EPCC, University of Edinburgh Tuesday, 21 October 2003 Overview of a Grid Scheduling. 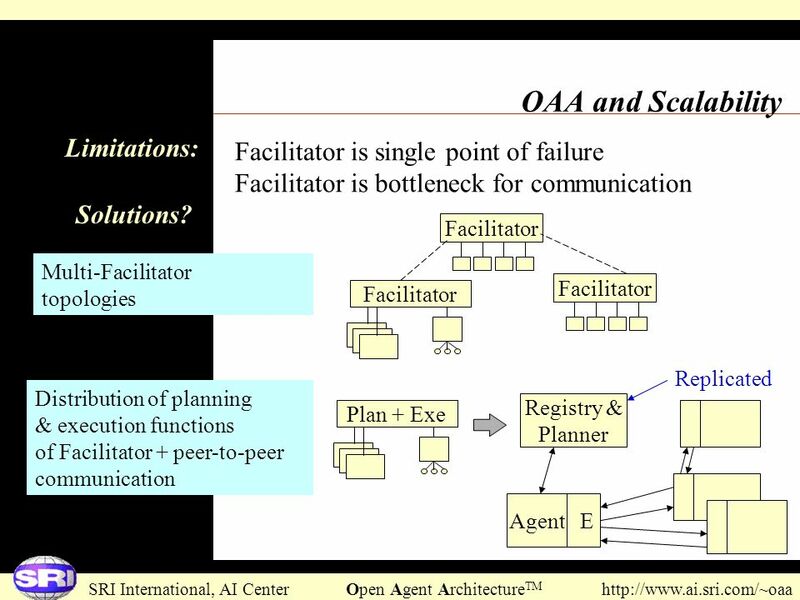 Technical and design issues in implementation Dr. Mohamed Ally Director and Professor Centre for Distance Education Athabasca University Canada New Zealand. WEB- BASED TRAINING Chapter 4 Virginija Limanauskiene, KTU, Lithuania. TSpaces Services Suite: Automating the Development and Management of Web Services Presenter: Kevin McCurley IBM Almaden Research Center Contact: Marcus.